British Springtime is an odd beast, especially here in the North East. A climate that was good enough this morning for your correspondent to safely operate a lawnmower soon turned to "jumper on inside the house" weather. 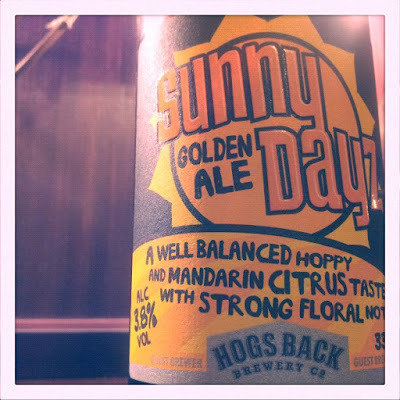 When laying out plans for drinking and writing about the five new beers that make up Aldi's craft range I had pencilled Sunny Dayz, brewed by the seemingly-very-prolific-in-recent-months Hog's Back Brewery, as my post-gardenwork refresher. As I throw treasured photographs and the deeds to the house into the fire in an attempt to survive the icy tendrils of a resurgent Winter I wish I'd saved last night's warming coffee porter for this chill-bound evening. That may have been a slight exaggeration. But I am wearing a jumper indoors right now. I know I'll not feel the benefit later. Please forgive me. It's chilly, it's a poor setting for a summery golden ale with a geet big blazing sun on the label but I've made my bed, and the crack of the cap lets out a plug of middleweight and greenish hop scent, which shifts after one inhale to an orange aroma at the heavier end of wispy (or the thinner end of slender). There's a little bit of earthy, muddy malt there; a little fresh dirt on a fresh fruit. An extremely light and thin pour fills the glass with parade-ground-polished gold, headless save for a skeletally thin ring of foam around the surface circumference, sometimes as little as one bubble in thickness. These bubbles are annihilated by the first mouthful, as the bullish taste of biscuit stomps onto the tongue. The hops are less present in the taste than they were in the nose, and the aftertaste does fill out to reveal a sweet, orangish buzz. Giving the beer a few minutes at the half way point to get a little air and a little closer to room temperature elicits a taste that is fuller and fruitier, the citrus sharper and grittier, catching on the tongue and digging in for the aftertaste. As the final taste lingers on the senses, evolving to marmaladey bitterness the low alcohol volume (3.8% abv, making it the weakest of the range) is evident through the lack of alcoholic warming. Golden ales don't tend to be complex beers, and Hog's Back have made more complex beers than this. Sunny Dayz is a beer for the things it's named after, a clean and simple beer with a pleasing taste that can be drank in multiples all day on one of those fictitious English Summer days when it doesn't rain at least twice in a 24 hour period. A drink that is very easy to throw down one's neck with a quickness, it makes up for its tendency to be glugged speedily with an aftertaste that echoes the word "orangery" up and down the cavern of the mouth. 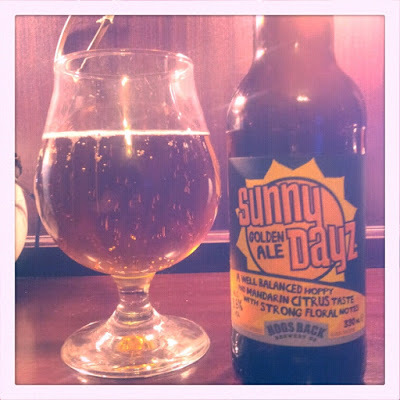 Sunny Dayz outperforms more than a few macro breweries' golden ales and does it on the cheap. It's a beer to jam a coolbox with on one of the three or four sunny days we might get this year.